LAKELAND – Visitors to the Florida United Methodist Center, particularly those who attend meetings and training sessions, may notice some changes underway on the third floor, which is home to Missional Engagement and Connectional Relations. Offices are being constructed to house members of the Missional Engagement team, which was created last year and includes Global Missions, Disaster Recovery and Justice & Multicultural Ministries. 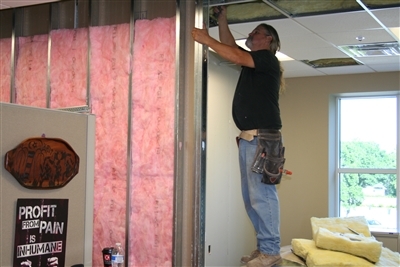 Construction workers are busy creating new office space in the third-floor east wing of the Florida United Methodist Center. Photo by Susan Green. “One of the reasons we’re doing this is to get the whole team up on the same floor,” said Rev. Clarke Campbell-Evans, Missional Engagement director for the Florida Conference. New to the team are coordinators for a young adult mission initiative and the upcoming Imagine No Malaria campaign in Florida. Those staff members will also have desks in the new digs. The construction is expected to take a few weeks and will include installation of a door at the entrance of the Connectional Relations office on third floor’s west side. No changes are anticipated to third-floor meeting spaces typically used by staff and guests, including the large board room and kitchen area, Campbell-Evans said.